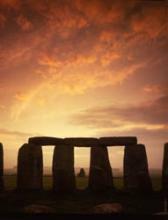 New testing at the highest stone circle in southern England show that it could be as old as Stonehenge. 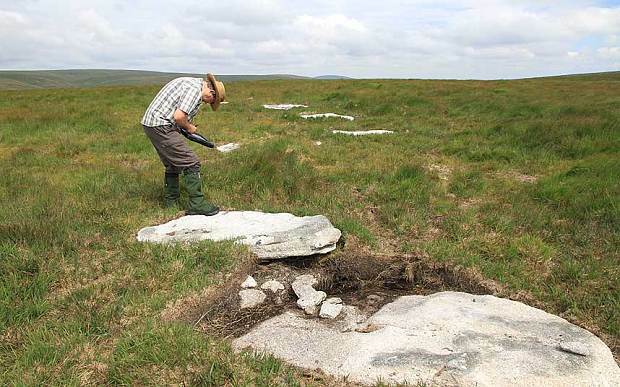 The first radio-carbon testing ever carried out on a stone circle on Dartmoor’s open moorland show that the stones at the ring near Sittaford Tor fell over some 4,000 years ago, meaning they could have been built considerably before this. Mike Nendick, from Dartmoor National Park authority, said the dating showed that the ring, 34 metres in diameter, could be “of a similar age to Stonehenge”, which was built between 2,000 and 3,000 BC. The circle, on the northern part of the moor, is the first on Dartmoor to have been investigated in 100 years, and at an altitude of 525 metres is the highest in southern England. It is the second largest ring in the Devon national park, the biggest being Mardon Down near Moretonhampstead, at 38.2 metres in diameter. Thirty of the stones in the ring are now lying flat, but researchers believe they once stood upright because of packing material found around their bases. He said that the building of the sacred arc showed, “a level of co-operation between tribal communities” for religious purposes, adding that this and other discoveries in the national park suggested “not primitive peoples but highly skilled artisans,” who traded internationally and with other coastal communities. Dartmoor has about 15 stone circles, which are typically 20-40 metres in diameter and mostly similar in design, excluding characteristics such as central pillars, which are found in formations in other parts of the West Country. One example is Scorhill, near the village of Gidleigh, which is an English Heritage scheduled monument and has been described as one of Dartmoor’s finest rings. The full report from the geophysical testing is expected in a few weeks’ time, when researchers expect to further their knowledge of the Sittaford Tor site. During the research, a trench was discovered running up to one side of the circle, but its purpose remains unknown at present. The research was made possible by funding from Moor Than Meets The Eye, a Heritage Lottery funded scheme. The Sittaford Tor circle is also a similar age to the Ring of Brogdar on Orkney, and 500 years older than Flag Fen near Peterborough. Dartmoor is one of the most significant sites of Neolithic ruins in Western Europe, home to about 5,000 prehistoric houses and many dozens of stone circles.